Whimsy is a tricky thing, particularly for a comedy show. As many a mediocre improv scene has shown us, a premise that tips too far toward the fanciful runs the risk of floating off into space, unmoored by any rules or reality. While comedy requires heightening, it also requires honesty. If everyone is crazy and wild, anything is possible, so nothing matters. At its worst, overly whimsical comedy is boring, and at best, it’s merely cute—eliciting “aww”s rather than laughs. 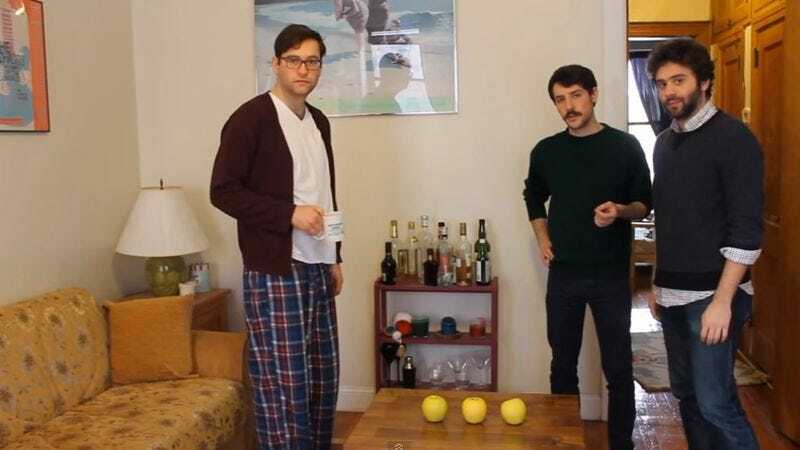 Yet a well-considered dash of whimsy is often a key ingredient in the most potent comedy, as evinced by Good Cop Great Cop, an energetic and deftly filmed sketch series created by (and occasionally starring) Matt Porter and Charlie Hankin. At first blush, the world they’ve created is a zany one, populated by superheroes, hypnotists, and time travelers. Yet these familiar figures are imbued with a depth, and even a pathos, that pushes them beyond the realm of tropes. These stock-seeming characters experience real regret, real heartbreak, and real pain—and for that, they’re all the funnier. Where to start: Good Cop sketches are delightful on their own, but the series really shines when viewed as a whole. With time, a distinct worldview emerges from the disparate premises, a creeping darkness on the edges with a sense that something dangerous and disturbing just happened—or is about to happen. A good jumping-off point is the recent installment “Apples,” which features Hankin and Porter helping out a friend (played by Drew Lewis) who is panicked over a familiar problem. It escalates nicely, and the grounded, genuine performances sell the episode’s central conceit. Where to watch: You can watch the full series on YouTube or at the official Good Cop Great Cop site. If you enjoy it, stay tuned for Hankin and Porter’s upcoming post-apocalyptic web series for Comedy Central, New Timers.